Mario and Luigi go to the Mushroom Kingdom only to find out that Bowser and the Koopa Kids had kidnapped the Princess and held her prisoner in the seven Koopa hotels. Like a classic Super Mario game requires, you have to save the princess. This time though, you won't find her in Bowser's Castle, but in Bowser's Hotels! Each level takes place on a fixed screen with different levels and plenty of doors (hence the hotel theme). The point of the game, a la Elevator Action, is to go through elevators to get to different floors and close all the doors on the map. Yes, there's no flags to grab but there are plenty of enemies that wander around the level trying to touch you and make you die. You can jump on them or hide inside doors to bypass them. Some rooms contain items, such as coins, mushrooms, and fire flowers, which serve their typical Mario purpose of giving extra lives and allowing Mario to take multiple hits. When you close all the doors on the screen, you move on to the next level. At the end of each stage is a Koopa Kid boss, and when you “beat” him by shutting all his doors, it's on to the next hotel. The idea for this game sounds good on paper but the execution is average. Mario scoots around at a set speed and doesn't grow bigger with mushrooms—his overalls glow but that's it, really. Jumping and shooting fireballs require mastery of the controls (i.e., jamming buttons at the same time) and can be tedious, if only because the Cd-i controller is so terrible. Enemies are rather predictable but they do get more difficult as the game progresses, and top that off with the stupid elevators that mixes up the order they move and enemies that open doors you just closed and the game walks the line of being genuinely difficult and just plain petty. It's not a fast-paced Mario platformer and for that, many Mario fans may find the game monotonous, but for what it does, it does it whole-heartedly enough. 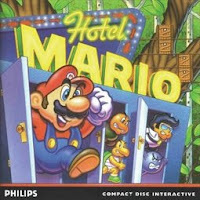 Despite the fact that Nintendo had no production in the game, Hotel Mario has a lot more in common with the original series than the Zelda Cd-i games. Mario and many of the game's enemies, consisting of Goombas, Koopa Troopas, Bob-Ombs, Boos, and others, look like docile versions of their Super Mario World counterparts. Also, it's nice to see the Koopa Kids return for one last game, if only as a bunch of stupid-looking enemies. The game earns points for at leasting sticking to the Mario concept, though you cannot take off and leave the screen. The game's visuals are good, according to Cd-i standards. Each of the seven hotels has a theme—forest, cave, brick building, etc. gives a different look on the action and make progressing to the next level a treat. Mario and the enemies' sprites look a bit awkward as they are either too sluggish or too quick, but the look grows on you with extended play. The sound effects are a mixed bag of funky, upbeat tunes and other ad-libbed sound effects of Mario's jumps and whatnot. I actually thought the sound, especially the music was pleasant, and is one of the best parts of the game. Hotel Mario isn't a bad game but it breaks from the Mario formula too much to be a really good game. The game's pacing is decent but the controls and the repetitiveness take a toll in the long run. If you do happen to find of the game, it serves as a better collector's item than an actual game. Perhaps you may enjoy the game very much, but it's an acquired taste that's a hit-or-miss with each and every gamer. Philips should have pushed the unreleased Super Mario's Wacky Worlds on CD-i out the door if only they believed in the gaming potential of CD-i a little sooner!